Years ago, when I had just started working as the editor of Fine Woodworking, I was seriously admonished by Paul Roman, the founder of that magazine and the Taunton Press, that woodworkers don’t have a sense of humor. I thought he was wrong then, and now a new book helps me prove it. The woodworking TV star's solid oak emojis are a more old-fashioned, more personal, more American. One foot in diameter they weigh 14 lbs. This is an eclectic combination of commentary, silliness, projects, and profiles, as well as some serious discussion about wood and tools. 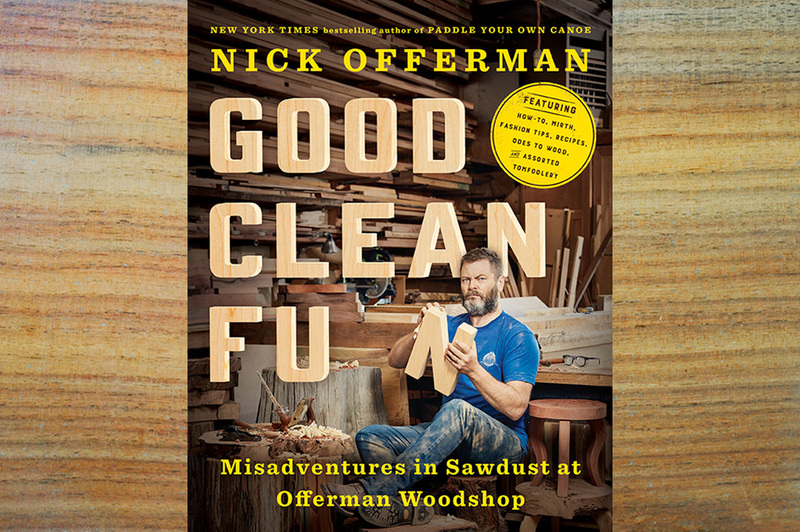 Profusely illustrated with photos, drawings, and even cartoons, the book takes readers on a mad romp through the world of woodworking as seen through Offerman’s eyes. Every time you think he’s going to get really serious on you, such as expressing strong opinions about how to finish wood, he turns around and spins you into something to force a smile or maybe to send the beverage you are drinking in the wrong direction as you bust out in uncontrolled mirth. Similarly, projects highlighted in the book range from the whimsical, such as a wooden kazoo or a bottle opener made from recycled scrap wood and a nail, to more serious examples of craftsmanship like a walnut slab table or a dining chair. He profiles the people who work in his shop and some woodworkers who have inspired him. One profile covers renowned art furniture maker Gary Knox Bennett, who like Offerman, is seriously famous for not taking things so seriously. A photo series showing how to coil a band saw blade turns into a rivalry between Offerman and another of his shop workers, who deftly does it one-handed much to Offerman’s envy. 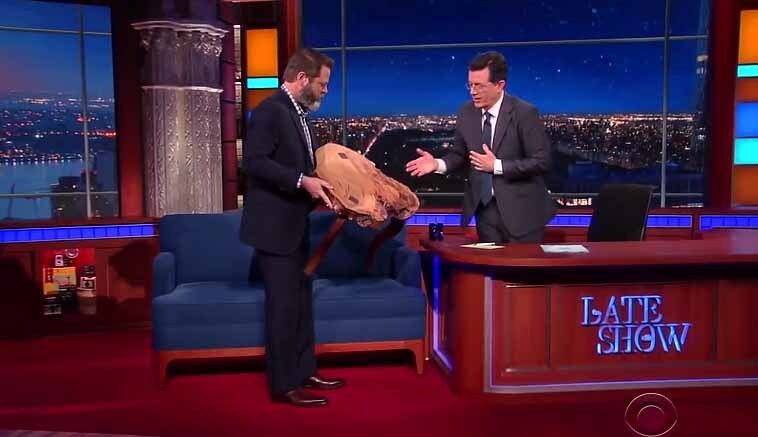 Offerman reminds us that even the most sober discussion about shop safety can be done with an ample dose of humor. He repeatedly brings home the level of joy and satisfaction that working with wood gives to woodworkers, whether they do it every day for a living or just dabble in it on weekends as a hobby. 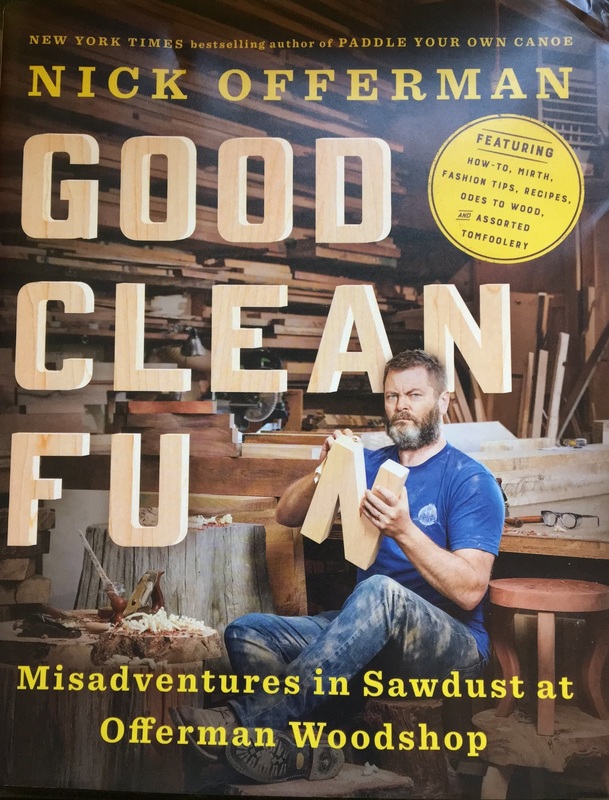 In some respects, that makes the book a kind of parody of more serious books about woodworking. This isn’t Jim Krenov or George Nakashima intensely discussing a reverence for wood and woodworking (although Mira Nakashima is profiled in the book). Instead, Offerman gently cajoles us to not be so darned serious and have a little fun. I think there are plenty of woodworkers who would raise a glass to that. The book would make a great gift for your favorite woodworker, that is, if you think they have a sense of humor.